You're going on vacation great; but you're worried about your waistline? You should be. Guess how much the average person gains while on vacation. Wrong, it's almost a pound a day. That's a lot to take off when you return. However that doesn’t have to be you. Most of the time extra pounds sneak up on you when you least expect it, so decide right here and now that your vacation will leave you slimmer than when you left. All you have to do is have a game plan; and then follow it. Vacation days are notorious for carbohydrate rich meals, and it's a well-known fact that too many carbohydrates will quickly add up to unwanted pounds. Combat this fat-trap by choosing one meal per day to go carb-less. Have you ever noticed how travel days create the perfect opportunity for snacking? A coffee and muffin before your flight, a snack on the plane and then before you know it it’s lunch time! Taking a road trip? This opens up even more opportunities for regrettable snacking such as: rest stop vending machines, gas station quickie marts and of course the never ending string of fast food restaurants along the highway. This summer cut unhealthy snacking off at the pass by bringing along your own healthy options. Dried or fresh fruit, unsalted nuts, health bars, cut veggies and low fat crackers are a good start. By filling up on these healthy snacks between meals you will end up eating less when presented with a less-than-healthy meal. #7: Team up with a Pro at Sports Fitness Solutions! Well, fitness is Our specialty; and since you are serious about creating a healthy and fit you, guarantee your results by teaming up with us. We will come up with a fitness plan that is tailored to you, fits your lifestyle; and helps you quickly achieve your fitness and fat loss goals, even on vacation. So enjoy your vacation; and know that you can still have fun and not gain that pound a day. OK I know what you're thinking, "What's a MicroGreen" Salad? Microgreens are tiny leafed vegetables that are harvested when less than two inches tall. They have remarkably intense flavor and high levels of vitamins and minerals. Pair this salad with a piece of lean meat for an excellent, light meal. This is healthy and easy recipe. 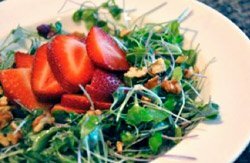 Simply toss the microgreens with strawberries and dressing. Sprinkle with walnuts. There it is, and it tastes great, enjoy! One serving equals: 124 calories 6g fat, 8g carbohydrate, 3g fiber, and 2g protein.